Mia is a granola-eating, sensible shoe-wearing, carbon footprint-conscious twenty-something living in a multicultural neighborhood in Chicago. Her mother, Babs, is a stiletto-wearing Zsa Zsa Gabor type who works as an activities hostess on a Caribbean cruise line...and if you guessed there's some tension there, you'd be right. Factor in an unexpected pregnancy and Mia's idealistic boyfriend, and the mother-daughter relationship is, well, stretched very thin. As is Mia's sanity when Babs shows up to...help. Actually, Mia has a whole neighborhood of quirky characters who want to help, including her BFF, Frankie, a magenta-haired librarian; Silas, the courtly gentleman of indeterminate age who lives downstairs; and Adam, proprietor of the corner grocery store where Mia shops. But it's Adam-endearing, kind, possessed of a perfect smile and impeccable Persian manners-who ultimately charms Babs and rescues Mia from more than one mother-induced meltdown. Could it be that Mia and Babs might actually be able to get along? 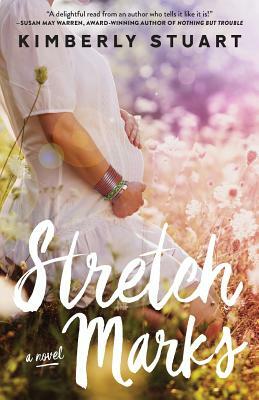 With Kimberly Stuart's trademark irreverent humor and a surprising and satisfying take on romance, Stretch Marks is an authentic but tender story about family, grace, and the importance of a good grocer.